Difficulties in living in a different culture are caused by different patterns of thinking, feeling and potential actions. A good way to experience cultural immersion is to walk in a crowd. Simulated Crowd is a novel tool for allowing people to practice culture-specific nonverbal communication behaviors. 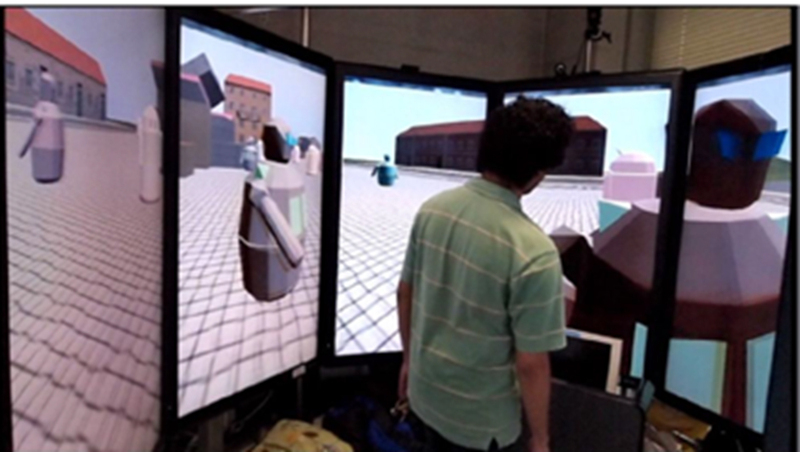 A conceptual framework of a simulated crowd is realized using an immersive interactive environment. Technical challenges include real-time eye gaze recognition in a dynamic moving situation, sensing of nonverbal behaviors using multiple range sensors, and behavior generation based on novel temporal data mining algorithms. Figure 1 illustrates how the user interacts with a simulated crowd with synthetic agents. Queuing behaviors have been added.